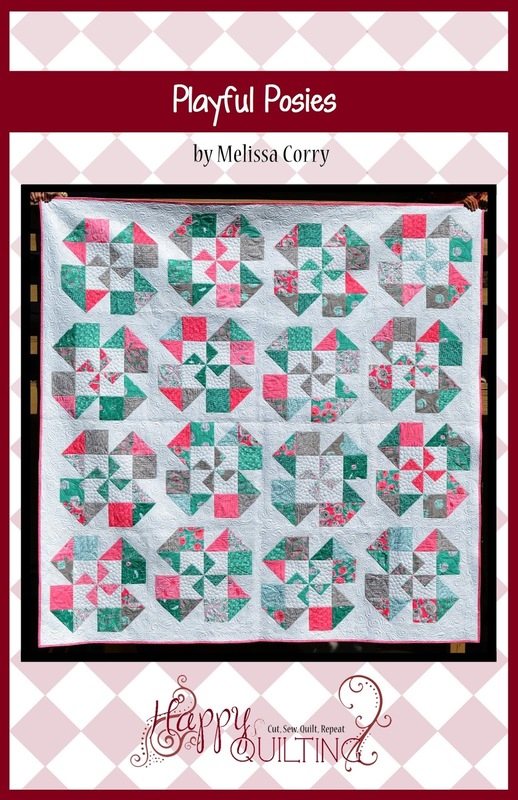 Happy Quilting: Playful Posies - A New Finish and Pattern!! I am super excited this morning to share my newest quilt finish as well as my newest Quilt Pattern in the Happy Quilting pattern lineup ;) It is called Playful Posies and I just love it!!! This version of Playful Posies is made up using Amanda Herring's Curiosities line for Riley Blake Designs. It was the perfect fabric to incorporate that wonderful whimsy I was going for with the design. And I just love the colors, so pretty!!! And when it came time to quilt it I went all out with some custom quilting!!! I did echoed petal arches in the "petals" of the flower, and three echoed feathers in the pinwheel center. Then to fill in the background center I did pebbles and then an allover echoed paisleys and swirls in the quilt background. And can I just say, this was just so much fun to quilt!!!! I really loved every minute of it. And I just had to share a picture of the backing and binding because I just loved the basic gingham and polka dot together. So classic and I wasn't going to use the hot pink at first, but I am so glad I did because I just love how happy and bright it is !!! And this quilt is Fat Quarter friendly, so it is super easy to grab a bundle and get going. And I included a second option in the pattern for a Two Print Block Layout, so you can choose that if you prefer it to the scrappy layout shown. Either way, the quilt will look incredible!!! And my quilt is the queen size, so it is 92" x 92" and still only 16 blocks to make, yippee!!! 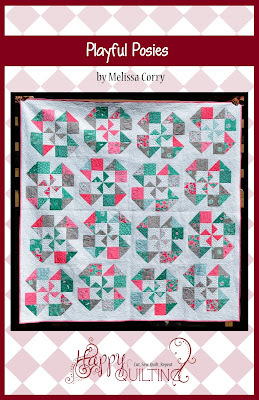 I love your new quilt pattern, Melissa, and your fabric selection makes it just beautiful! Great quilt - love all that yummy quilting texture! What a fun quilt! It would look great in so many different colorways...or totally scrappy.